I would like to receive occasional information and updates from Valegro, raising funds for Riding for the Disabled and jumblebee. Valegro, ridden by Charlotte Dujardin CBE and trained by Carl Hester MBE, has taken the sporting world by storm. In an unprecedented career Valegro and Charlotte became the only combination and individuals to ever concurrently hold Olympic, World and European Gold Medals in the sport of Dressage plus all 3 World Records, and then successfully defend their individual Olympic Gold Medal at Rio 2016. Not surprisingly the combination was repeatedly ranked No 1 in the World, and labelled as 'the best the world has seen'. Carl was awarded MBE and Charlotte OBE in 2013, with Charlotte being further awarded CBE in 2017 following her and Valegro's 3rd Olympic Gold Medal. Carl was honoured with Fellowship of The British Horse Society (FBHS) in recognition of his outstanding contribution to equestrianism. As well as achieving world-wide fame Valegro has been voted this and other Nations' favourite horse. Valegro is now enjoying a very well earned and relaxed retirement from competition. We hope the opportunity to have this fantastic memento of an outstanding combination of horse, rider and trainer will raise much-needed funds for the Corse Lawn Riding for the Disabled Group, local to Valegro's home. Beautifully mounted and framed the photograph of Valegro, Charlotte and Carl taken at Valegro's retirement at Olympia has been signed by both Charlotte and Carl, and Valegro's shoe has been silver-plated. Valegro's shoes, unmounted or accompanied by a signed photograph as we have here, have previously achieved very good amounts when auctioned for charity, with $7,500 achieved recently in USA. We welcome your bids for this superb memento and aim to raise as much as we can for Corse Lawn's Riding for the Disabled Group. 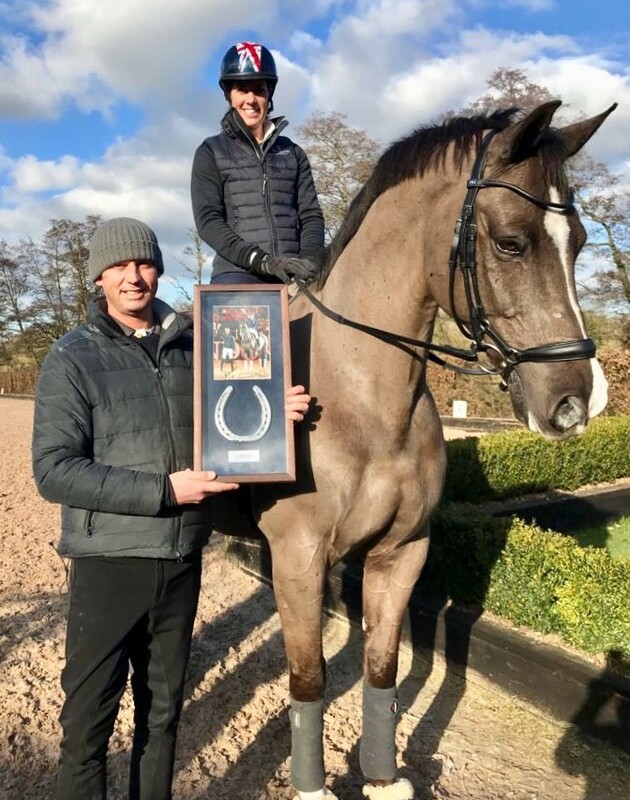 Valegro's shoes, unmounted or accompanied by a signed photograph such as this, have previously achieved very good amounts when auctioned for charity, with $7,500 achieved recently in USA. We welcome your bids for this superb memento and aim to raise as much as we can for Corse Lawn's Riding for the Disabled.